my heritage and my beginnings on a farm on the Oklahoma plains. 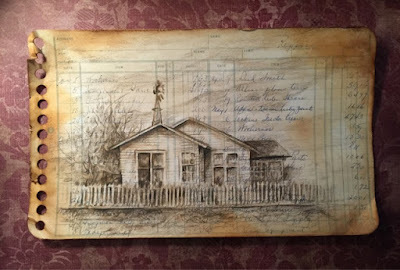 I have often been approached by Native American artists who compare my work on dictionary pages to their tradition of creating artwork on ledger pages. The only paper many Native American tribes had was the pages from ledgers used during trading. Like so many people, they created their artwork out of what they had. 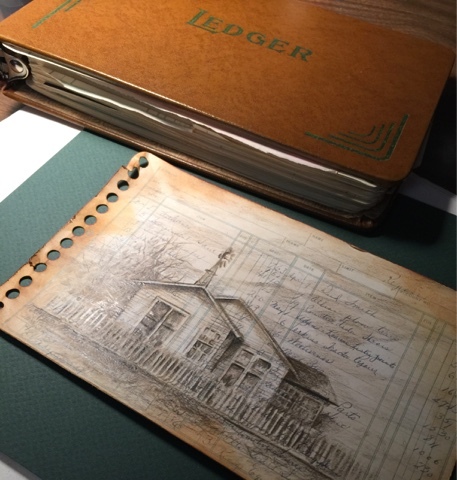 After my parents passed away I discovered stacks of old farm ledgers. My mother was a meticulous bookkeeper and she recorded everything in these books. I discovered detailed entries about every vaccination, wedding, and feed purchase. I've considered doing something with these books for a long time and this last week I decided to try my hand at creating something with them. I have to admit that I wasn't keen on drawing directly over all this family history. Nobody else in my family really wanted these old books but I hated to damage them. So I scanned a few pages and printed them on a high quality, laser printer. Then I replicated the color and hole punched spine. I did most of the drawing with a sepia colored pencil. When I finished the drawing I mounted the page of stiff card stock and distressed it with ink. The page I decided to play with first was one which documented house repairs over the years. The heading on the page was 1931. Many of the entries are to businesses in our little, farm town - some still in business, others long gone. 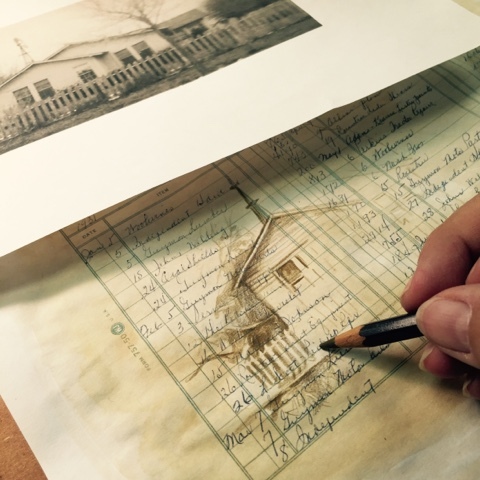 Since this page was about house repairs it made sense to draw a picture of our farm house. My grandfather first built this house close to 100 years ago and my parents added on as they could. It is still standing and occupied. I am anxious to know what people think of this "cousin" of my dictionary drawings. I'm going to continue to play with these pages. I love revisiting my family history. I love how the art looks old and antique with a lot of layers of history. Beautiful work.